London Ship Managers (LSM) made substantial savings across its fleet of 9000gt refrigerated cargo vessels following an extensive refrigerant plant optimisation programme carried out by Oceanic Technical Solutions. 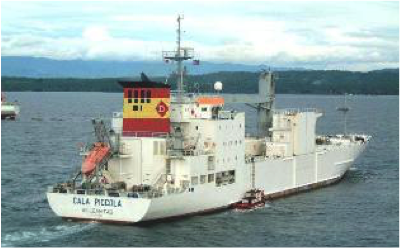 An engineering team from the Asia division of the UK-based refrigeration specialist carried out complete marine refrigeration inspections aboard the Cala Portese, Cala Piana, Cala Pevero and Cala Piccola. LSM Technical Fleet Manager Mike Seymour said: “We found we were spending substantial time and resources looking and checking for gas leaks which were still not being efficiently detected, in order to try and remove any environmental impact our vessels were making. This, along with losses of refrigerant obviously had a monetary impact, which we also wanted to reduce.” We operate large direct expansion-type reefer plants, with a substantial amount of pipe work penetrating decks and bulkheads, so gas monitoring and detection is a highly complex task for us. Taking just three days to inspect the entire plant on each ship, the Oceanic Technical Solutions team carried out a full system evaluation and performance test, finding substantial gas leaks from corroded pipe work in bulkhead penetrations. Once Lloyd’s team found the source of the leaks, the plant was shut down and isolated so repairs could take place. Additional isolation valves were fitted and when the plants were running to optimum, shipboard crews were shown how best to carry out routine inspections. “The catalyst for inspection was to reduce the amount of refrigerant being used and to prevent gas escaping to the environment. We achieved that,” said Lloyd. While LSM has made annual savings of about 15% year-on-year with replacement of refrigerant cylinders, frequent refrigeration inspection and optimisation prevents compressor wear and tear and increased loads on generators as they compensate for systems with reduced refrigerant. Robert Chesters, Oceanic Technical Solutions’ Managing Director, added: “With vessel movement and vibration, it is inevitable that refrigerant leaks will occur, with seals breaking down and valves coming loose and so on; but the key is to carry out frequent performance tests and to keep on top of the maintenance. Simple measures, such as regular oil changes, replacing filters and tightening valves and flanges, can make a huge difference.